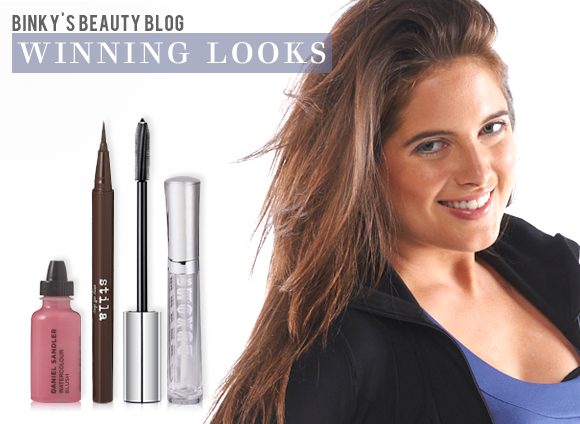 A big sporty shout-out from Binky’s Beauty Blog, and this week I’m blogging in Lycra! To be precise it’s USA Pro lycra. Let me explain. You see, we recently started filming series 4 of Made In Chelsea, and you know that old showbiz saying that television puts 10lbs on you, well sadly it’s true. I’d forgotten how much the cameras increase your curves, but the minute I saw early footage from the new series, I was straight on phone to renew my gym membership. I’m determined to discover my inner athlete (she’s certainly kept herself well hidden recently!) and really shape up. I want to be fit in every sense of the word.Luckily, the great thing about working out is that it doesn’t take too many sessions before you get that feel-good fitness buzz and start actually enjoying yourself – especially if you’ve got a tasty gym instructor to keep you going when the going gets tough. In fact these days I’m surrounded by buff guys and it’s all thanks to the mass outbreak of Olympic fever. Suddenly my local gym is packed with muscular hotties feeling the burn. But while that sounds dreamy, it also means I’m spending as much time getting ready to break a sweat as I am actually pounding rubber on the running machine. No girl – whether she’s a gym bunny or a new recruit – wants to get caught looking red-faced and sweaty when some cute sporty guy strolls by. Thankfully there’s a whole raft of gym-proof cosmetics out there that’ll keep your face looking great even when your body’s close to collapse.So before I hit the gym, I put on my fit-girl face. I begin by smoothing on Dior Hydra Life Pro-Youth Skin Tint. The gym is no place for heavy foundation, which will slide straight off as soon as you break a sweat. A tinted moisturiser like this one is the perfect solution, giving a light touch of cover yet still letting your skin breathe. Next up, I create a subtle healthy glow by applying Daniel Sandler Watercolour Blusher to the apples of my cheeks. Yes, I know I’m meant to be achieving a healthy glow via my workouts, but there’s no harm in faking it to begin with. This brilliant silicone-based fluid blush has amazing staying power, giving my face a natural dewy flush. A light dusting of loose powder fixes my look in place. Vichy Dermablend Setting Powder claims to provide smudge-resistance and water resistance for up to 16 hours, but since my workout sure isn’t going to be that long (more like 16 minutes!) I’m confident my make-up will survive the session. Next up, I give my eyes a little extra definition using Dior Long-Wear Waterproof Eyeliner in Intense Brown. I add a slick of Stila Stay All Day Waterproof Liquid Eye Liner across the upper lids, as its long-stay formula resists sweating, oiliness and tears – all of which are likely during the course of a tough boxercise class! Finally I boost my lashes with a couple of coats of Dior Diorshow Iconic Extreme Waterproof Extreme Wear mascara, which stays in place even when I’m starting to flag. All that’s left to do is brush on slick of bareMinerals Buxom Lips, a lip polish that helps to plump up my lips while I plump up my muscles. Now, with my fit-girl face in place, it’s time to work on my fit-girl body. See you down the gym! This entry was posted on Friday, August 17th, 2012 at 2:18 pm and is filed under Binky's Beauty Blog #BBB, Get the Look, Guest bloggers, Make-up. You can follow any responses to this entry through the RSS 2.0 feed. You can skip to the end and leave a response. Pinging is currently not allowed. Where I your coat from, from last nights episode?